Door Hangers are perfect to announce you’re the new business in town. Printed on durable 14 point cover stock and available in quantities as low as 500, they also include a 1″ diameter notched hole for hanging on doorknobs. Door hangers are a simple, effective marketing tool with scores of uses. 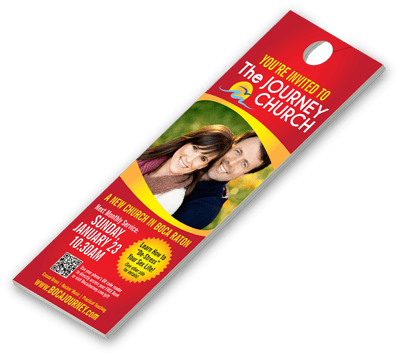 Use door hanger printing to announce a special sale or event, create a buzz about a new business in the area, or introduce a longstanding business to potential new customers. Door hanger printing and advertising can also be used at conferences at a host hotel to promote the schedule of seminars, activities, and other special events. Restaurants: Include your menu (or live entertainment line-up) on the hanger and offer a coupon. College Students: Spread your message across a busy campus. Nonprofits and Local Clubs: Get these printed with sequential numbering and detachable tickets and use for fundraisers and raffles.